BACK IN STOCK & READY TO SHIP!! 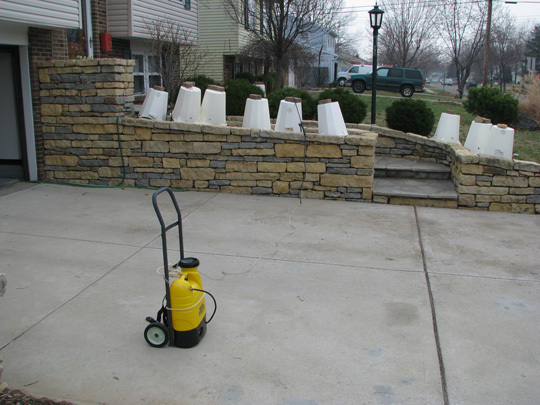 First, let me say that we have been looking for a sprayer like this for many years. When customers called in the past that did not need or could not afford the Spotshot sprayer, we pointed them to the Black & Decker battery-powered backpack. This was a nice little unit that sold for around $100, and although we did not sell this unit, we felt it fit a huge category of customers with small to medium-sized gardens. It didn't have a long battery life but was the best thing out there in the price range. Unfortunately, this unit is no longer manufactured and until now we had nothing to offer. Customers note: Past versions of this unit came with casters. In our opinion they served no practical purpose since they were not constructed to "move" the unit when full. We found the unit harder to fill with the casters and are happy to report this sprayer no longer has them. Last be not least: If you cannot carry the weight of a backpack sprayer full of water (about 50 lbs) you can strap this unit to a light-weight furniture dolly. Many of our customers have extended the hose by 10 feet (parts available at your local hardware store). This configuration makes it easy to move about the garden and give you some extra reach. ".....I decided to simply attached it to a 2 wheel dolly I bought at Home Depot for $29 and I spliced a 15' section of hose to the original. This will work much better for me with my bad back and no mess with lots of extension cords to deal with. Needless to say I am a very happy customer. I will be passing this information along to my fellow members in the Cincinnati Rose Society as well as a demo video of how I have mine set up. Thanks a million, Allen Thomas." Below is a photo of Allen's NeverPump.